You can use cheers in the dugout in a variety of ways: for your team, to taunt the other team, or for specific positions on the field. Regardless, they are sure to bolster camaraderie. One of the easiest and most basic cheers is to simply shout out your team's name along with something like "Go!" or "Who's number one? Team Name!" One of the things that makes softball dugout cheers different than most cheers is that you can cheer for the other team - not necessarily that you want them to win, but in appreciation and respect for coming out and playing the game. "2-4-6-8, you know we appreciate…Opposing Team Name"
3-6-9-12 we can't play all by ourselves! Remember when you're cheering for your batter that you can give her encouragement for more than just hitting a home run. There are so many different things that can happen when a batter swings that the cheers get really creative. For a grounder: Ain't nuthin' but a ground-dog, rollin' down the line…Woof! Woof! Naming the Batter: (Batter's name), she's so fine, (Batter's name), she's a friend of mine, Swings a bat in her hand, She's gonna slam it like no one can! Homerun: Look at our batter! Smilin' faces! Watching her run all around the bases! Of course, you can also create many cheers that are against the other team's batter just by turning these kinds of cheers around (Fowl ball! (chicken noises)). Dustin her hands off & laughin' in your face! 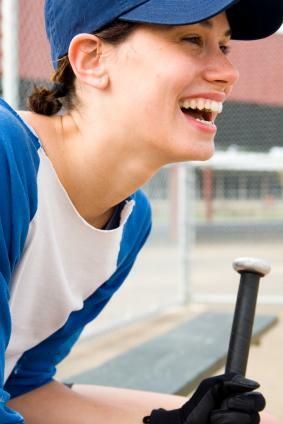 This is an example of a cheer designed to unnerve and unmotivate the pitcher on the opposing team. It's not always easy to find ways to get under the skin of these cool characters who have to perform well even when the entire game is focused on them. Pitcher's got an arm that's a washing machine! Can ya spare some change? Can ya spare a quarter? Cuz your pitcher's arm looks like it's out of order! You should always try to come up with individual cheers that fit your team and your players whenever possible. However, if you need inspiration, there are a few sites on the web that can provide you with places to start. eTeamz has a lot of different categories to choose from. LoveToKnow.com also has several softball cheer articles besides this one that you can draw inspirational quotes from. Cheer loud, play hard and remember, it's all about having fun!